In this clever document, they reveal that athletes could face a tax bill – to those wonderful folks at the IRS – of nearly $9,000 thanks to America’s unfriendly worldwide tax system. US medal-winning athletes at the Olympics have to pay tax on their prize money – something which is proving controversial in the US. But why are athletes from the US taxed when others are not? The US is right up there in the medals table, and has produced some of the finest displays in the Olympics so far. … But not everyone is happy to hear that their Olympic medal-winning athletes are being taxed on their medal prize money. Athletes are effectively being punished for their success, argues Florida Senator Marco Rubio, a Republican, who introduced a bill earlier this week that would eliminate tax on Olympic medals and prize money. …This, he said, is an example of the “madness” of the US tax system, which he called a “complicated and burdensome mess”. All they need to do is make an extra form for the olympic medal winner to complete on his tax return. If an olympian is making a million dollars from sponsors, there would be a place to deduct the medal winnings, but the athlete should have to pay taxes on all that sponsor money, less his/her training costs and travel. In this situation, I have no problem with the taxation. Years ago, I did some international traveling as part of my job. It didn’t even occur to me that my income while in various countries be taxed in those countries. I see athletes as contractors in a comparable situation. Now had my offices actually been in those countries, then that would be another issue entirely. Finally, I dislike Rubio’s approach since I despise laws, especially tax laws, written so specifically for narrow groups; they are far too close to Bills of Attainder for my taste. It carves out yet another, no doubt badly written, loophole that will cause grief down the line. What I wonder is how many pages would this bill add to the TAX code regulations? Then would the IRS create a new FORM for it, with 42 page instruction booklet with all the exemptions, clarifications, qualifications and convoluted references to other booklets and tax forms or code? However, if the bill becomes a reality rather than just a political news cycle story, we can fully expect that KISS will not be part of the implementation. Complexity is bound to follow. Here’s an idea: Have the CATO Institute come up with a number of categories for politicians to win gold, silver, and bronze medals for getting rid of the complicated tax code. Then pay them with Food Stamps – Obama has increased the amount after all – which are tax exempt. 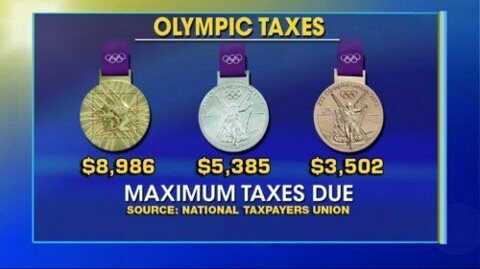 In the meantime, Marco Rubio should suggest paying the Olympic athletes with Food Stamps to get over the tax burden. Perhaps I am missing something here. I am all for tax overhaul. I think we are over taxed mainly because our government over spends on a massive scale. But with everything else being equal, how is it wrong to tax the athletes on their winnings (earnings) from their hard work any more than it is to tax any other citizen on the earnings from their hard work? You said it correctly – they are being taxed on the superior athletic talent. This country is so turned around and wrong. These althletes have worked 24/7 for years and years to perform and be the very best. It is not fair to be taxed on the hard work you did in your sport. Oh and that is without the government help – that could be the problem. This government’s greed is nothing less than sinful. Nothing gets done without someone along the way paying damn taxes for their hard work in all forms. Just sickening and not what America is about at all.